Bringing business to Omaha is important. That’s why The Bill Black Team offers corporate relocation as one part of our multi-faceted services. It’s about more than business, it’s about doing the right thing. What does our corporate relocation service include? When you have recruited someone new to your Omaha-based team and are ready to bring them on, it can be tough to know what the next logical step should be. That’s where The Bill Black Team comes in. When encouraging someone to uproot and move to Omaha, we recognize that’s a big step in a person’s life. That’s why it’s important to educate the person about Omaha. There are many things that make our city unique but those from out of town don’t know what it is until we tell them. I spend a certain amount of time with someone who is considering relocating to Omaha just introducing them Omaha and telling them about what makes Omaha a great place to live. I answer any questions they might have about this area. This service is often overlooked by other builders, but is valuable to anyone who has ever relocated to a new area. How can I possibility tell someone how great Omaha is without actually showing them? I also give tours of Omaha. These tours can be short or as in-depth as they need to be until a potential new resident feels as confident and comfortable as they need to be to make the decision if Omaha is right for them. The right thing to do doesn’t need to cost anything. The Bill Black team doesn’t charge for corporate relocation services. We simply want to help others and, if they choose to move to Omaha, we hope they will allow us to help them with their housing needs. Again, this is the right thing to do, so we may receive nothing in return and that’s OK.
Do you know someone whose business might be relocating them to Omaha? 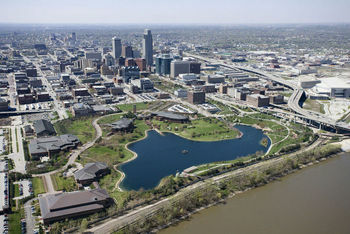 Or, do you just know someone who might be considering moving to Omaha, even if their job doesn’t require it? Whatever the case may be, our corporate relocation services may be just what they are looking for.